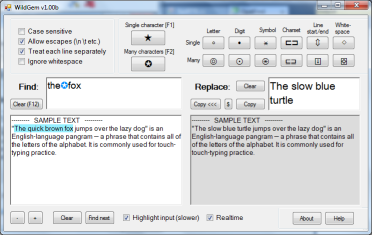 I'm the author of WildGem, a free, portable, single-file application meant primarily for people who don't have the time to get into Regex, but who sometimes find the find/replace feature in their text editor too limiting. 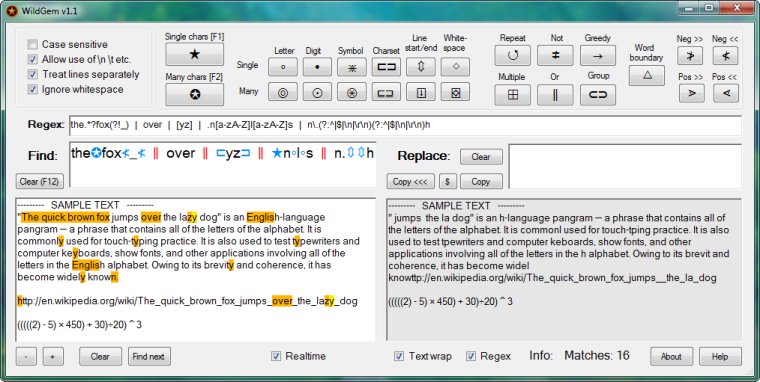 Even expert Regex users however may find the application useful as it does support Regex, and offers a fast, fluid interface. Like my other OpalCalc program, WildGem features 'update-as-you-type', colour coding, and an uncluttered interface. 1: Shorter, and clearer expression. 2: One such symbol replaces over 20 Regex symbols! (it detects the start/end of a line or a newline). 3: The characteristic symbols, are more intuitive to interpret, and also more memorable, at least for initially learning the syntax. twinbee: Welcome to the forums and thanks: I look forward to testing this out. Learning Regex has been on my list for way too long now so I'll see if this is a bit more achievable. Thanks, and hope you find it helpful! Though the program wasn't specifically designed to learn Regex, you could definitely choose worse (the on-the-fly updating and large input/output areas help a lot imo). Let me know if there's anything in particular that you think should be added. Yup, WildGem writes a prefs file in 1.22 but only to its own directory where it resides, never anywhere else. Just thought I'd add too, WildGem is 2 to 10x faster than Notepad++ at finding/replacing! Not sure if that's due to the Regex flavour or what. But it's certainly handy for files around a gigabyte or more. As an example, the 2x faster bit is for occasional words, and the 10x faster bit is for say, replacing commas in a CSV. 2016-02-17: v1.23: Added view End of Line mode (this makes it a lot clearer when doing fidgety queries that involve the end or start of a line). Also fixed bug involving replacing when lookahead/behind (e.g: Pos >>) is used in the query (replace didn't work before - it does now). WildGem is easy to use, offers lots of replace criteria and is portable and stealth (all settings saved in WildGemPrefs.txt inside program folder). WildGem has been reviewed at Softpedia (this is where I actually first came upon it and then searched the forum). I love the concept of your software and I was looking forward to using it but I found, to my disappointment, that it suffers from the same problem that 99% of all software suffers from: what little explanation offered is written by the person most intimately familiar with the program who is, because if that intimacy, unqualified to introduce the program to people who have never seen it before. I'm sure that how to use your app is blindly obvious to you at this point but when I look that this window with all the buttons & arrows & checkboxes & textboxes I have no idea where or how to start. None at all. I'm completely mystified. The correct way to develop software that Human Beings can actually use is to test it on an actual Human Being before you release it. Ideally you should go and find the Village Idiot, sit him or her down in front of your test station and watch their reaction. Prepare to have your ego deflated. Weeks later, after you've managed to coach your VI to actually operate your program and you've made the massive UI changes necessary to make your creation usable and you've written an understandable Help file (that your VI can understand) then it's probably time to consider a public release. But nobody does this. M$ doesn't, Adobe doesn't, Oracle doesn't so you should you? Because you've put a ton of work into your program and you'd naturally like some recognition for all that work. You had an idea and you pulled it off and deserve credit for that. But I assure you that i'm not the only one who understands regular expressions well enough understand the value of your app but is baffled by the UI and the lack of a plain english explanation of how to use it. Last edited by kosmo on Sun Apr 08, 2018 11:43 pm, edited 1 time in total. Hi kosmo, I'm the creator of WildGem. As a first step to dip your toes in, simply start by clicking the "Defaults" button near the bottom right, and then in the "Find" box, simply type something to search. Watch how matches are magically highlighted as you type! Now try entering something in the Replace box. Watch how the highlighted words get replaced by whatever you entered in that. Notice how it finds "ove", "ohe", and "ome", since the middle letter is a wildcard (represented by that 5-pointed star) ! You can click the ★ button and that enters it into the Find box. @kosmo: great take on the pits and falls of UX development. Thanks for the QuickStart Tips but what’s missing here is not just the lack of a few pointers. Your app is stuffed with features. It has 41 buttons, 10 checkboxes and 5 text windows. And your website uses 462 words to explain how great your program is - and i’m sure that’s true - while it contains zero words on how one would actually USE the program. Or what any of the 41 buttons, 10 checkboxes and 5 text windows are for. Or how one introduces the text that you want to search or modify to your app. Or what the buttons are for. And what is often the single most useful part of any well-written Help file: examples of usage. It’s all missing. It’s the “Elephant in the LivingRoom” that you’re ignoring while you pretend that your app is finished and ready for Prime Time. Do you know that there are tooltips if you hover the mouse over the buttons that explain what they each do? There's also a Help button at the bottom right. Or how one introduces the text that you want to search or modify to your app. Simply copy and paste. Or alternatively use the "Load file..." button conveniently placed above the text box. single most useful part of any well-written Help file: examples of usage. Good point! I still think because everything's on the window with no hidden menus or other windows that it's FAR easier to use than any similar program. Especially because everything updates instantaneously. I might look into doing some examples at some point though. In the mean time, let me know what you'd like to accomplish and I'll be happy to help!